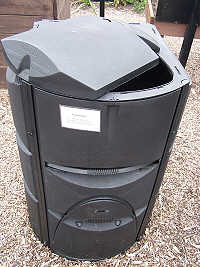 You've probably seen the ready-made compost containers available for small to medium sized gardens. Their good design owes much to moulded recycled plastics. They work by a steady thru-put of regular small-scale additions of organic matter. The time and expense to build a small heap with timber construction hardly seems worth it. That's why the (re-cycled) plastic compost container is an exciting development. They solve the problem of low input, save space and still produce the goods. With smaller gardens that's ideal. 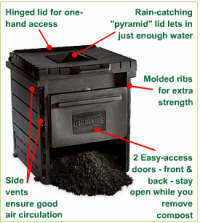 Without a doubt this is perhaps the simplest and one of the best small compost bins. Two sizes available. The narrower upper section with tight lid recycles moisture internally. The material quickly reduces in volume so it won't be full for long. As it shrinks spread it out to ensure it fills the wider cross-section lower down. The one-piece compost container is easily lifted off the heap whole to move to a new location. You can easily turn the heap by repositioning the container beside the heap and spading the material back into it again. Mine provides moist black stuff thick with worms and a faint earthy smell - LOVELY the picture above doesn't do it justice. The Cone Bin stands 40" (1 m) high, 32" diameter and holds 12cuft. << or click this image. Note: an additional Converter Base Plate is available for mounting on solid surfaces or to prevent vermin entry. 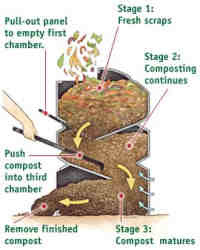 The removable bottom door provides easy access to finished compost. I saw this one displayed at the Garden Organic in Ryton, Coventry. Its design takes full advantage of moulded plastic. 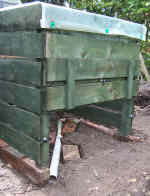 A removable upper shelf retains material for an initial stage of rapid hot composting. Slide the shelf back to let the material down the middle section where composting continues. Finally use a rod to push the composted material down to the bottom to mature. The system has advantages. Material at the same stage of decomposition gets hotter than when mixed with older material. The system more or less prevents unfinished compost from mixing with completed compost. It also gives the worms a clear run in the cooler lower section of the container. In the U.K. you can find the Earth Maker Aerobic Composter on this link. Another 'down to earth' composter. This one simply snaps together. If you have arthritic fingers then you'll find the push button opening lid an improvement on the compost converter. Also the doors can be used as leaf collecting scoops. Same rules apply - keep it full and the material spread wall to wall. Several doors provide plenty of access to the finished compost. At 30" square and 34" high this bin can hold 16 cubic feet of material. 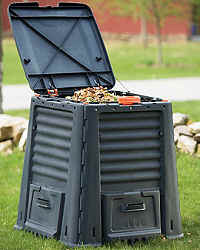 A popular compost bin. This has a wider opening and added organic matter will be more spread out. Periodically turn the outside of the heap to the inside and vice versa using a fork or aerator. It has an open base and an additional rodent screen can be obtained to thwart burrowing animals. 28" square 34" high. Comes as a flat pack with self assembly to make a bin advertised to contain 12 cu ft, but I make that 15CuFt. Find more details about these and other composters on this link . 2 things are important when aerating your heap - to break apart dense clumps, and to move the material that has been on the cooler outside to the hot centre. Aerating tools have been designed specially for stirring up the heap. They do save you somewhat from getting your hands dirty. U.S.A. gardeners have a "deluxe version" - a 2 handled aerator with 2 sets of folding stirrer wings and in the U.K. composting accessories include a simple aerator. Plastic is very durable. No maintenance needed. Copyright © The Organic Gardener.Com 2004 - 2013.